To make the most of emerging technology, logistics professionals need a firm handle on supply chain trends, and the connected platforms that drive actionable insights. A number of emerging technologies are poised to boost efficiency, improve communication, and drive innovation in the logistics space. While many of these trends are relevant to other key industries, retail and shipping in particular stand to benefit. Rising e-commerce demands paired with a shortage of skilled labor in warehouses and supply chain fleets means that logistics professionals are under increasing pressure to use cutting-edge technology to satisfy client needs. To do so, it’s imperative for managers to understand which supply chain trends will make their mark on 2019 — as opposed to those that are still highly conceptual and out of reach for most businesses. If you’re hoping to improve your supply chain management for 2019, consider how the following trends might impact your operation. With expert guidance and the right platforms to leverage data integration, these technologies can boost ROI while preparing your business for the next generation of logistics needs. For logistics professionals, robotic technology has long been on the wishlist of supply chain solutions. With mounting pressure on workers operating on the warehouse floor, the picking process can be especially time-consuming. However, advances in this area are making robots more affordable than ever — not to mention more cooperative with many warehouse management systems (WMS). Autonomous mobile robots (AMRs) in particular will gain greater traction in 2019 as businesses look to bridge the labor gap with scalable technology that can boost efficiency and provide valuable insights into performance. With worldwide sales of robots designed for the logistics space projected to top $22 billion, the coming year will likely witness big moves toward a more automated future. While there has been apprehension in the past about cloud technology, in recent years this area has continued to prove its dependability. It’s understandable how some businesses might have reservations about trusting off-site third parties with their proprietary data, but improved platforms are now safer than ever. 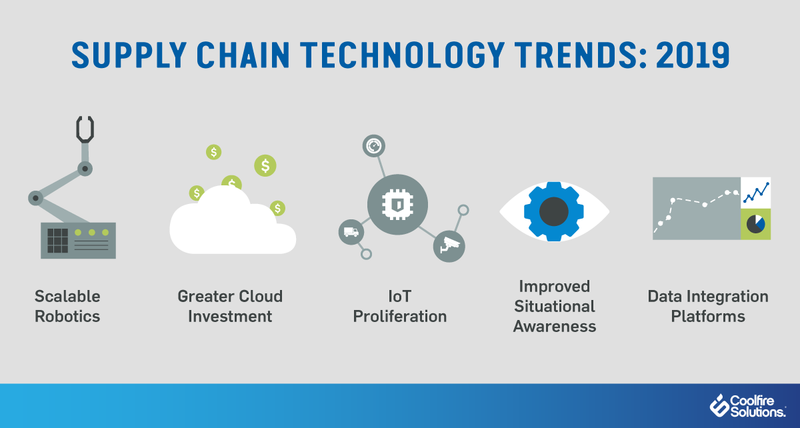 Accordingly, supply chain managers should prepare for a surge of cloud technology investment in 2019. With experts predicting that 80% of supply chain interactions will take place on cloud-based networks by 2020, logistics professionals will be relying more on the cloud to store, analyze, and manage actionable data from across their operations. On a similar note, research shows that by 2021, 20% of top manufacturers will rely on embedded intelligence such as the Internet of Things (IoT) to boost automated processes throughout their supply chain. 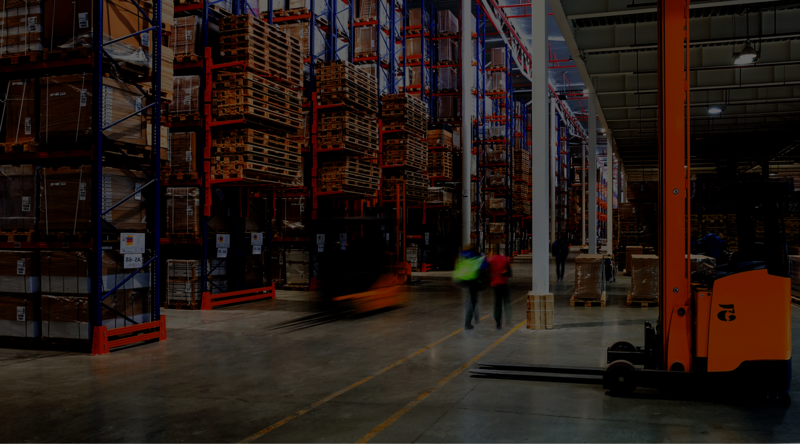 With sensors integrated into logistics hardware, IoT can provide valuable insights into supply chain management. Indeed, while IoT has been a buzzword over the past several years, faster networks, improved sensor technology, and stronger data integration platforms are now able to bring it to scale. Whether supply chain managers use IoT to oversee their fleets or to organize operations more strategically in their own warehouses and facilities, 2019 is poised to see major investment in this emerging technology. Driven by new technologies, logistics operations will be able to use data to make strategic decisions. With IoT devices providing key information throughout each stage of the supply chain and cloud platforms securely storing that data, professionals will have greater situational awareness over their operation’s performance, from the routing of fleet vehicles to the efficiency of AMRs. While situational awareness can be a benefit to any number of industries, it will be particularly relevant for the logistics business over the coming year. Thanks to the quickening pace of e-commerce sales, supply chain managers need real-time updates to avoid bottlenecks — and to help resolve them efficiently when they do occur. In order to make sense of various data streams, however, logistics professionals will need sophisticated tools that can turn raw information into actionable insights. For example, while it’s important to harvest data on the condition of cargo in a wide range of fleet vehicles, it’s not strategically useful unless you can quickly interpret that data and understand the next steps to stay on target. Fortunately, these advanced integration platforms are already available — as is the smart technology that generates the data. By analyzing data streams from IoT sensors to AMRs, you can empower drivers, warehouse workers, and management decision-makers with dependable information that helps everyone meet their goals. Logistics professionals know that their industry is constantly evolving — and always on the move. By understanding supply chain solutions and investing in the most promising tech as it comes to scale, it’s possible to get ahead of the curve and set your team up for success. 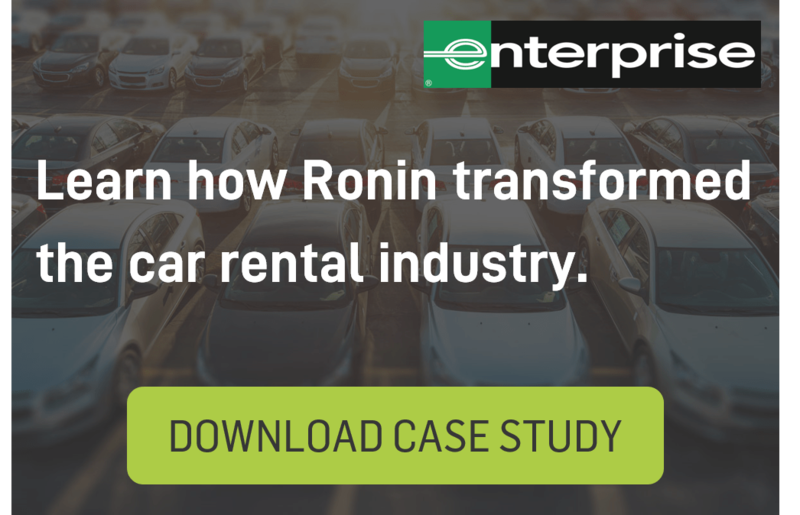 Driving value for your business means more than buying the latest hardware, however. Without investing in platforms that can integrate diverse types of data, the most exciting technology in the world won’t boost situational awareness over your supply chain. Instead, consider the processes that turn each purchase — from IoT devices to cloud services — into an actual value-add.